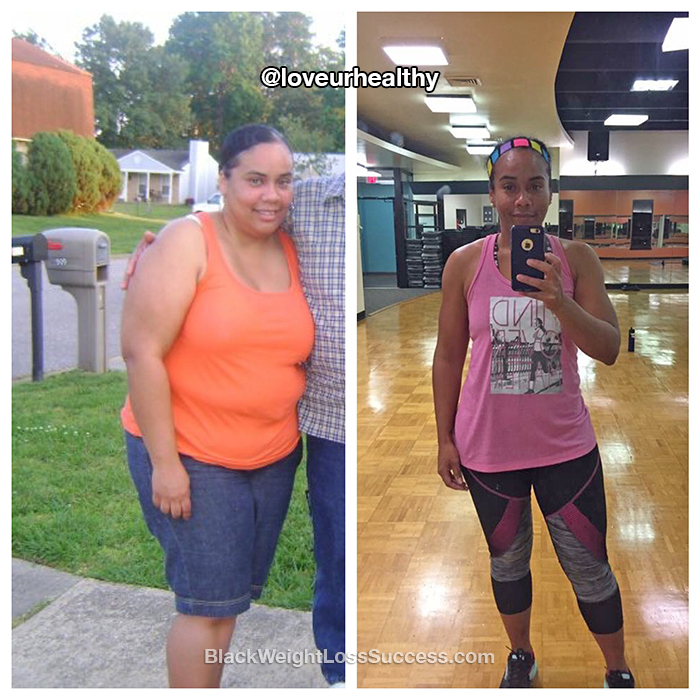 Transformation of the Day: Glenda lost 99 pounds. 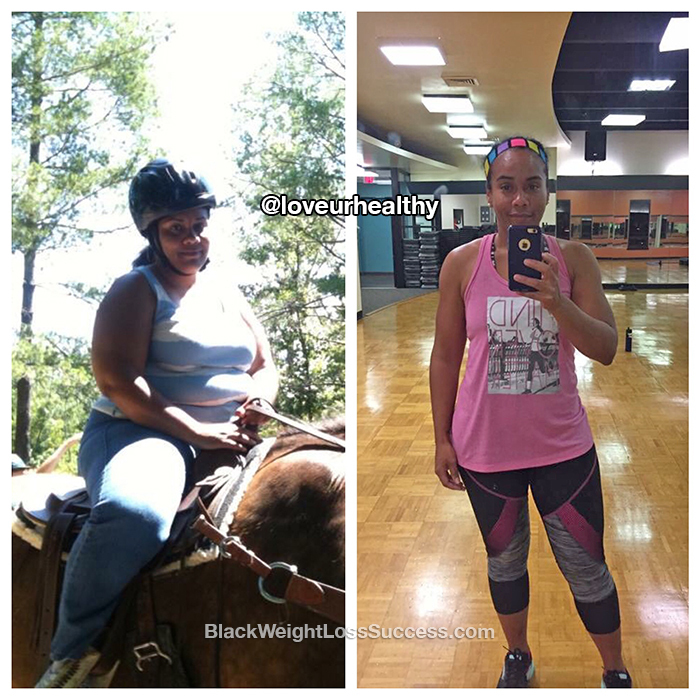 This wife and mom of three was depressed about her weight gain. Feeling low after a wardrobe malfunction at work, she made a commitment to show up for herself everyday and be consistent. She lost the weight and has kept it off for 2 years. Check out the details of how she did it. My name is Glenda. I am a 37 year old married mother of 3 kids. I began my weight loss journey at the end of 2012. My doctor had told me in June of 2012 that I needed to do something about my weight. He said that he didn’t want me to have any medical problems and if I continued on the path I was on, I eventually I would. He said it was important for me to get my weight under control. Little did he know, I was already depressed about my weight. I was tired all the time and didn’t want to do anything that required me to go out doors. I wasn’t comfortable in my own skin. After having 2 kids in a span of 22 months, my weight just kept rising. I was at the point where I didn’t want to look at myself naked any longer. I was at a low place. Later that year, my daughter was entering her freshman year in High School and I saw a friend of mine. She looked great. I couldn’t stop looking at her. I finally talked to her and told her how amazing she looked. I asked her what she was doing? She said she’d joined back Weight Watchers. The next day I just couldn’t stop thinking of her. I was sitting at my desk at work and the button on my blouse popped. You could imagine how I felt. I starting crying at my desk and felt so low. My shirt was already a size 2X. That day was the day that I decided I was going to do something about my weight. My journey began by following the Weight Watchers program. I followed the Points Plus program, which is now the Smart Points program. People may think that Weight Watchers is all about the frozen meals in the super market, but it isn’t. I eat a variety of foods that I actually like, in moderation. I have to say that I do eat more vegetables than I ever did before. In the past, my vegetable intake consisted of corn… that’s it. I also find that I enjoy experimenting with different foods to see what works for me, all with moderation in mind. Two of things that I have given up completely is soda and juices. In the past, I could drink a 2 liter soda by myself within a day or so. I stopped that completely. Now, I only drink water, tea and coffee. Water is my main beverage. I hit Lifetime at Weight Watchers in 2014 and I still attend meetings and follow the program. After losing a bit of weight, I began incorporating exercise. I began by walking, then I did Zumba for a while. Later, I started doing boot camps, HIIT workouts and strength training at my local YMCA. Once I got lighter on my feet, I started running. I would say tht I have been running for close to 2 years. I’ve also participated in 5k’s, 8k’s and 10K’s. I have even done 2 half marathons. It’s pretty amazing when I look back it now. I have also participated in 3 Spartan races the past year and recently enrolled in Crossfit classes. The healthier I got the more confident I felt in my abilities to try different things. When I started exercising, I went about 3 days a week to the gym with one day of walking. I currently workout about 4 days week. I do strength training workouts and Tabata style workouts (with a run if I can manage it). I also bike ride with my kids and husband and do Just Dance with them. This journey has definitely become a family affair. At my doctor’s appoint in June of 2012, I weighted in at 251 pounds. When I started Weight Watchers on October 25, 2012, I weighed in at 235 pounds. I currently weight 152 pounds at 5’3″. I officially started my journey on Oct 25, 2012 and I became lifetime at Weight Watchers by hitting my goal weight and maintaining it for 6 weeks on Sept. 13, 2014. It took me 23 months to get rid of the weight and I have maintained my weight for a little over 2 years. Through out this journey, I have wanted to give up many times. Losing weight and getting healthy is difficult. It’s an easy hard. I say that because we make it harder than it needs to be for ourselves. Whenever I felt like giving up, I think about that woman at the desk missing her button. I think about how she felt and how she cried. I never want to feel that way again. As my journey has progressed, when I feel like giving up, I think of my kids. I think of all the things we are able do together since I have lost the weight and gotten healthy. This new quality of life is so much better and I don’t ever want to lose that. There is so much advice out there for losing weight, but the two main things for me were being consistent and showing up for myself every day. The commitment I made when I began wasn’t to lose close to 100 lbs, because I didn’t believe I could even lose 20 lbs (that’s how low I felt). My goal was to be consistent and show up every week for my Weight Watchers meeting, no matter what. I did that and still do that. Consistency is key with anything you want to accomplish. You also have to show up for yourself, because this is for you. Now that I have lost the weight and gotten healthier my goal is to help other woman that just like me didn’t know where to begin or needed the motivation/inspiration to get to a starting point. I have started Love Ur Healthy this year to help the young and young at heart to love their healthy, because we all want to succeed but healthy looks different for all of us. You can find us on Instagram, @loveurhealthy and Facebook: Love Ur Healthy. You can follow me for motivation and inspiration as well on Instagram: @MrsCamp02. You are amazing. You look great. Thanks for sharing journey.